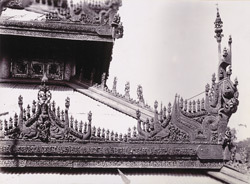 Photograph of carvings on the roof of the Queen’s Kyaung (Monastery) in Mandalay, Burma (Myanmar), from the Archaeological Survey of India Collections: Burma Circle, 1903-07. The photograph was taken by an unknown photographer in 1903 under the direction of Taw Sein Ko, the Superintendent of the Archaeological Survey of Burma at the time. The monastery was constructed in 1885 on the orders of Queen Supayalat, wife of Thibaw, the last king of Burma (reigned 1878-1885). It was barely completed when she was exiled to India with her husband following the annexation of Upper Burma by the British Empire. Now destroyed, the monastery stood in the grounds of the Royal Palace and was a magnificent wooden building richly decorated with ornate woodcarving and mirrored glass mosaic. It was known as the Queen's Golden Monastery for its glittering appearance. This is a view of a tiered corrugated iron roof ornamented with carvings. Burma has a long tradition of woodcarving, at which its artisans excel both technically and aesthetically, and the best work could usually be found on palaces and monasteries. The eaves are decorated with horizontal bands of floral scrollwork below scalloped pediments containing figures of sacred birds interlaced with foliage and divinities from the Burmese Buddhist pantheon. The pediments are edged with flaring horn-like projections derived from serpents or the haunches of an ox and rows of small figures pointing skyward. To the right at the end of the roof is a curving corner piece representing the breast of a peacock culminating in a spire. In Burma the use of tiered roofs, and spires known as pyatthats, was restricted to royal and religious architecture because they were symbolic forms demarcating sacred space. Mandalay was Burma’s last great royal capital and was founded in 1857 by King Mindon Min (reigned 1853-78) in fulfilment of a Buddhist prophecy that a religious centre would be built at the foot of Mandalay Hill. As a consequence of royal patronage there were many religious foundations in the city and a wealth of monastic architecture.